Liang Dong held up a clear plastic cube, an inch or so across, just big enough to hold 10 to 20 tiny seeds. Using sophisticated sensors and software, researchers can precisely control the light, temperature, humidity and carbon dioxide inside that cube. 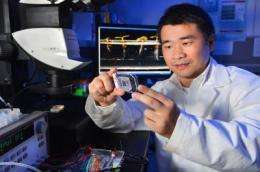 Dong – an Iowa State University assistant professor of electrical and computer engineering, of chemical and biological engineering and an associate of the U.S. Department of Energy's Ames Laboratory – calls it a "microsystem instrument." Put hundreds of those cubes together and researchers can simultaneously grow thousands of seeds and seedlings in different conditions and see what happens. How, for example, do the plants react when it is hot and dry? Or carbon dioxide levels change? Or light intensity is adjusted very slightly? The instrument designed and built by Dong's research group will keep track of all that by using a robotic arm to run a camera over the cubes and take thousands of images of the growing seeds and seedlings. Plant scientists will use the images to analyze the plants' observable characteristics – the leaf color, the root development, the shoot size. All those observations are considered a plant's phenotype. And while plant scientists understand plant genetics very well, Dong said they don't have a lot of data about how genetics and environment combine to influence phenotype. Dong's instrument will provide researchers with lots of data – too much for scientists to easily sort and analyze. That's a problem known as big data. And it's increasingly common in the biological sciences. "We're seeing a proliferation of new instruments in the biological sciences," said Srinivas Aluru, the Ross Martin Mehl and Marylyne Munas Mehl Professor of Computer Engineering at Iowa State. "And the rate of data collection is increasing. So we have to have a solution to analyze all this data." Aluru is leading a College of Engineering initiative to build research teams capable of solving big data problems in next-generation DNA sequencing, systems biology and phenomics. The researchers are developing computing solutions that take advantage of emerging technologies such as cloud computing and high performance computers. They're also building partnerships with technology companies such as IBM, Micron, NVIDIA, Illumina Inc., Life Technologies Corp., Monsanto Co. and Roche. The project is one of the three Dean's Research Initiatives launched by Jonathan Wickert, former dean of the College of Engineering and currently Iowa State's senior vice president and provost. The initiatives in high throughput computational biology, wind energy and a carbon-negative economy were launched in March 2011 with $500,000 each over three years. That money is to build interdisciplinary, public-private research teams ready to compete for multi-million dollar grants and projects. Patrick Schnable, Iowa State's Baker Professor of Agronomy and director of the centers for Plant Genomics and Carbon Capturing Crops, remembers when biologists had no interest in working with computer specialists. That was before they tried to work with billions of data points to, say, accurately predict harvests based on plant genotype, soil type and weather conditions. "Now we're getting huge, absolutely huge, data sets," Schnable said. "There is no way to analyze these data sets without extraordinary computer resources. There's no way we could do this without the collaboration of engineers." To date, the computational biology initiative has attracted $5.5 million for four major research projects. One of the latest grants is a three-year, $2 million award from the BIGDATA program of the National Science Foundation and the National Institutes of Health. The grant will allow Aluru and researchers from Iowa State, Stanford University, Virginia Tech and the University of Michigan to work together to develop a computing toolbox that helps scientists manage all the data from today's DNA sequencing instruments. Aluru said the research initiative helped prepare Iowa State researchers to go after that grant. "When the BIGDATA call came in, we had the credibility to compete," he said. "We were already working on leading edge problems and had established relationships with companies." The initiative, the grants and the industry partnerships are helping Iowa State faculty and students move to the front of the developing field. "One computing company wanted to set up a life science research group and it came here for advice," Aluru said. "Iowa State is known as a big data leader in the biosciences."